Chicoco Radio is a floating radio station being built by residents of Port Harcourt’s waterfront slums. 480,000 people live in waterfront settlements along the creeks fringing the city. The governor plans to demolish them all. When residents protested, they were shot. Tens of thousands have lost their homes. Chicoco Radio will allow them to reach out and speak up. From their floating platform residents will be able to demand their rights, campaign for change and celebrate their culture. Okrika Waterfront: 65,000 Threatened with demolition. Site of Chicoco Radio. Up to 19,000 made homeless. Governor gives seven days notice until the bulldozers. Homes and businesses of up to 20,000 bulldozed. Government agents came with guns to mark houses for demolition. Housing is a human right: Linus was shot in his home after security forces stormed his community, where people had gathered to protest demolition. The Governor personally ordered the demolition of Railway community, giving people seven days to leave. Seven days later, the bulldozers came. People pick through the rubble at Abonnema wharf. Many had moved here after Njemanze waterfront was demolished. Bullets and bulldozers: police, army, anti-terror special forces and State Security Service agents accompany the demolition machinery. Elizabeth George and her daughter Purity arrive from school to find their home destroyed. They were given no warning; they received no compensation. After tens of thousands of people had their homes and livelihoods destroyed without warning or compensation, we came out into the streets to say: ‘People Live Here’. We put up a campaign billboard. The government tore it down. But many voices make a city, and this is our rhythm, our right, our voice. Before the last rains, volunteers from the waterfronts put up a radio training studio, exhibition space and community gathering space. We call it our ‘media shed’ – made by local people, with local materials – our first step on a journey towards a community radio station. We’re asking you to join us. Prince played club football, made music and cut hair for a living. He was born in Fisherman Estate and when that was demolished in 1985 moved with his family to Njemanze waterfront. On 28 August, 2009, the wooden shack he built there was bulldozed with all his possessions inside. Since then Prince has been working full time with Chicoco Cinema and Chicoco Radio as a community organiser and as a photographer. Prince is documenting the programme and once the station is afloat and on air, Prince will be one of the station technicians. Ngozi is the daughter of Bundu’s Market Traders Women’s Association leader. Many of them were shot at and beaten when they took part in a demonstration against the planned demolition of their community. 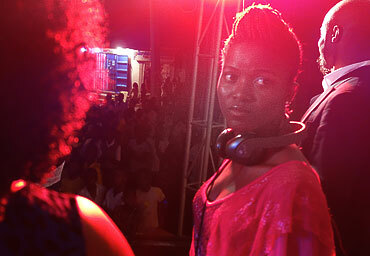 Ngozi joined the Chicoco Radio programme at the urging of her mother. 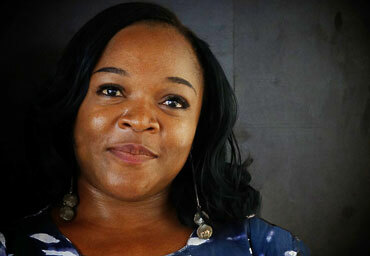 At first shy and quiet, Ngozi has bloomed during this course. She has discovered she has a real technical aptitude. And she has discovered her voice. 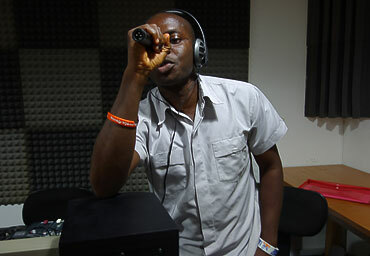 Chineyre works as a presenter for Garden City Radio, one of Port Harcourt’s commercial channels. She heard about Chicoco Radio from a family friend who lives in the city’s waterfronts. She had never visited a waterfront in her life and - given what she had heard about them - was nervous about stepping foot in one. But she also heard that Chicoco Radio was offering the best production training in the state and she has a passion for radio so she signed up for an interview. She is now committed to speaking up for the rights of her friends and fellow trainees. She will volunteer as a journalist at Chicoco Radio after her training. DJ Murphy was born and brought up in the waterfronts. 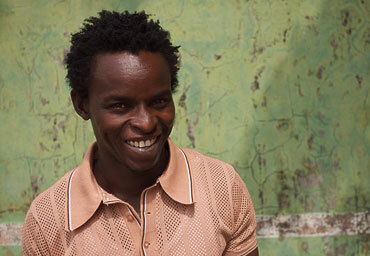 His dad is a chief of a nearby community and his mother is a fish trader. 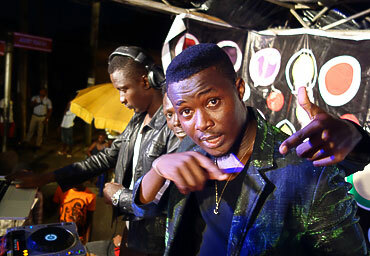 After secondary school DJ Murphy left his city for the music scene in Warri. He worked in clubs, learnt to DJ and got some production experience. 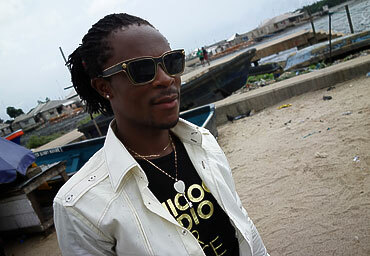 He returned to Port Harcourt’s waterfronts and since then has been dedicated to playing and producing music. He wants to be a sound engineer and DJ at Nigeria’s first community radio station, but he also has plans to study civil engineering at university in a few years. Favour has lived in the waterfronts all her life. She is a prolific writer. Her novels include, Sweet Revenge, Battle of Oaths, and Visit from the Underworld. She also writes raps for her friends. Favour wants to be a journalist and presenter. She has volunteered as the training programme receptionist and is madly excited about all the new people and the new ideas she has encountered by being part of Chicoco Radio. Vinta sang and made music in church as a child. He started performing his own music ten years ago. About the same time his waterfront home in Marine Base was demolished and he and his family moved to Okrika waterfront. For Vinta the struggle to make it as a musician and the struggle to live in dignity have been bound up together. He comes to Chicoco Radio to improve his sound engineering skills and to support a platform that speaks up for the right of people like him to live in dignity in their own homes. 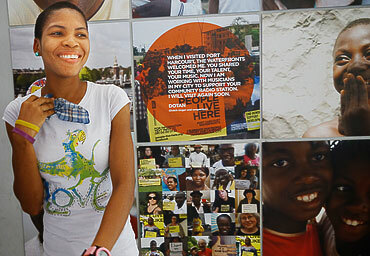 Gloria is studying linguistics and mass communications at University. She combines her studies with the training programme at Chicoco Radio. Gloria finds the quality of teaching and the facilities at Chicoco Radio much higher than at her university. Gloria and her family have lived in the waterfronts all their lives. Though the ever present threat of demolition means that anxiety and insecurity are a part of their lives, they are also proud to live in the waterfronts. Gloria hopes to work full time at Chicoco Radio after her studies and create opportunities there for many of the talented young people that are her friends and neighbours. Clement has always lived in the city’s waterfronts. He teaches social studies and mathematics at a secondary school in the waterfronts. He will not let the school or his home be demolished illegally. That is why he joined a group of young activists that are campaigning to end forced evictions in Port Harcourt. He and members of his group were shot at by state security agents during a peaceful demonstration that they organised at Bundu waterfront. Clement has always had a passion for language. He likes to talk and he likes to write. He wrote football commentaries as a child and after the training programme will volunteer as a presenter for Chicoco Radio. Chicoco Radio is powered by volunteers. We are training over 100 waterfront slum residents as citizen journalists, writers, sound engineers, programme presenters, studio operators, music producers, drama directors, news casters, station managers and community correspondents. They are all getting world-class training but we need your support to deliver it. Together we are designing and building two excellent radio studios and a music production studio with live recording facilities. Our volunteers and studios will be broadcasting from one of the poorest parts of the city, already at risk from flooding, so we want to float the station in the creeks. We are asking you to help keep us afloat and get us on air. €1,600 raised by an Amnesty International fun run. €18,500 Award from dutch postcode lottery. €5,000 donated by the Royal Dutch Embassy, Abuja. Chicoco Radio is a floating station built by waterfront slum residents in Port Harcourt, Nigeria. The Governor plans to demolish their homes. With their radio station they are reaching out, over the water and across the city — demanding their rights, campaigning for change and celebrating their culture. 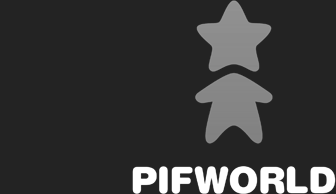 Help keep them afloat and get them on air. © Copyright 2013 Chicoco Radio. All rights reserved.